We all know the one about F1's gradual shift eastwards in recent times. It hasn't necessarily been universally loved either. Perhaps with good reason; plenty of the new Grands Prix have failed to really capture the imagination. Some have been cringeworthy. But there's one such latterly-established race that can hardly at all be considered a failure. Indeed instead it is a favourite, and in but visit number seven already it feels like part of the furniture. That the sport just belongs here and would be rather diminished without it. And the race is this weekend; the Singapore Grand Prix around the Marina Bay circuit. As for why this is, there are several reasons. But an overarching one is that it all just seems very F1. Or rather what F1 at its best would like to be. It is a glittering, vibrant event in which the visuals rarely fail to look stunning. For several reasons, the venue feels a lot like the Monaco for the new millennium. Just like Monaco, Singapore is a city state that is a quintessential F1 host, to the point that in the latter case you wonder at quiet moments quite why a Grand Prix wasn't established here decades ago. It is glamorous, dripping with money and tearing towards the future, and perhaps most importantly never fails to fully embrace its F1 visit. And in another way that it is a lot like Monaco, Singapore is the weekend that everyone wants to be at, that representatives of sponsors and other stakeholders - both current and potential - are brought. Plenty of deals are done here. Further, when the Marina Bay circuit arrived on the sport's itinerary someone somewhere had the bright idea to make it F1's first night race, taking its cue from other sports which showed that being conducted under floodlights somehow ratchets up the intensity. 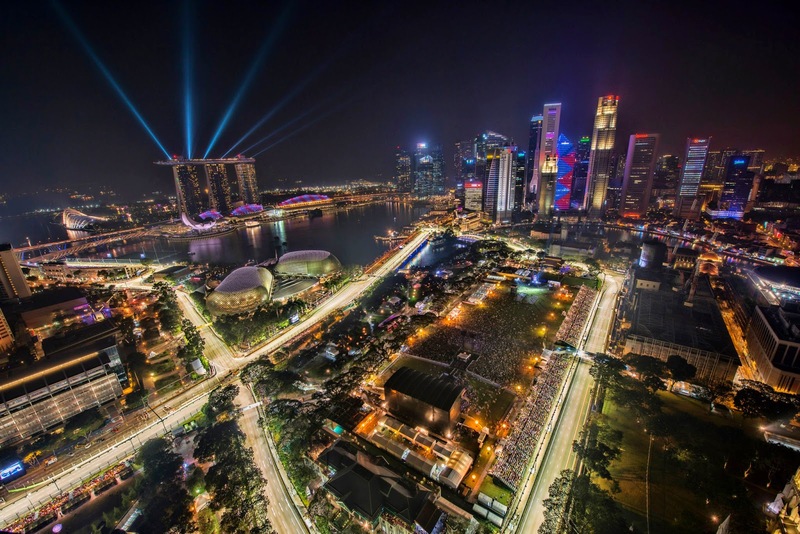 And it's hard to cite anywhere as more befitting for a race taking place after hours: not only does Singapore boast a fervent night life but the cityscape night time backdrop to proceedings is stunning; as well as that the cars never fail to look beautiful under the lights. Sure enough upon first sight the sport fell in love with the place and the event. In a further nod to the principality, the Marina Bay circuit is a proper downtown street track, almost a throwback, all bumps, city landmarks, with nearby barriers lining the snaking, tunnel-like layout offering little room for error. The acrobatic test with almost constant braking and turning means that the driver has scant opportunity for rest. Adding yet further to the demands is that the Singapore event is all run in crippling humidity that seems somehow trapped within the crowded confines, and as if to top it all off the race nudges, and often goes over, the two-hour limit in an age wherein no other race gets close (Lewis Hamilton once likened a race here to working out in a sauna for two hours). As may be befitting, the Singapore Grand Prix is almost standalone among today's F1 circuits in what it lays before the competitors - it represents the year's greatest challenge to mind and body. Perhaps underlining the grand, and unique, examination that the Singapore race poses, only three drivers have won the Grand Prix here in its short history: Sebastian Vettel (three times), Fernando Alonso (twice) and Lewis Hamilton (once). But with this - and that Hamilton is one of the few winners here - we shouldn't consider the result this time a foregone conclusion, even considering that the Mercedes will likely as ever set the pace. For one thing Nico Rosberg is another who appears to specialise in the Marina Bay track's challenges. Even in his pre-Hamilton days his five results here - achieved in a range of recalcitrant Williams and Mercedes - read as P2, P11, P5, P7 and P5. 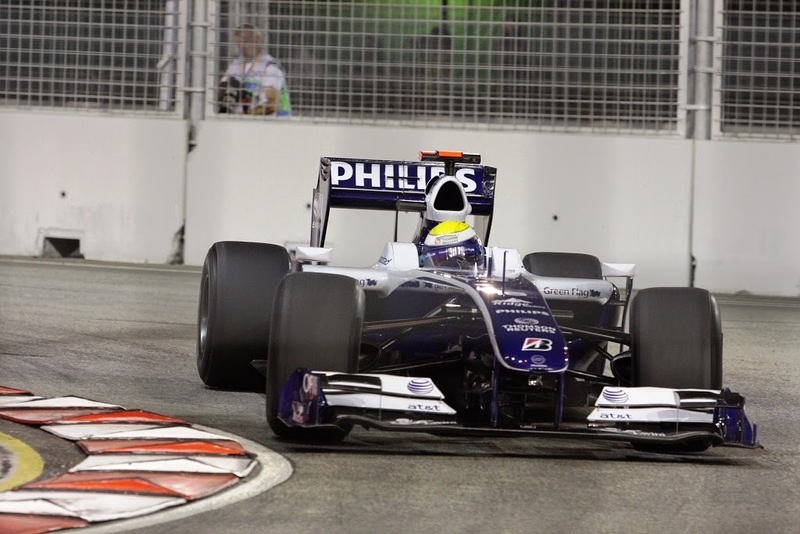 And that P11 in 2009 could very easily have been a P2, when he looked well on the way to finish there at the very least only to cross the pit lane exit line after a stop, and then having to serve his penalty after the bunching of a safety car period, losing him several places. Last year too in a direct match-up with Lewis he qualified three places ahead of him, with a best lap some three tenths under that of his stable mate. He finished ahead in the race too. Further complicating predictions is that the race may be a battle of survival. Reliability has never been entirely licked by the Brackley team this season and indeed both Merc cars wilted in the Montreal heat. Compared even with that the cooked, enclosed intensity of Singapore - stretched over two hours - will be something else entirely. Planning too far ahead on strategy can be perilous in Singapore also. The chances of a safety car here are 80%, the appearances of which can ruin a few strategies as well as rescue those seeking to stretch things out, plus here track position is important as overtaking is far from straightforward. Pirelli after going as conservative as possible in Monza has for Singapore gone as aggressive as it can, and one step softer than 12 months ago at the same venue, with the supersoft and soft tyres brought. Pirelli's Paul Hembery says this means we can look forward to interesting strategy variation. And indeed in races here there is a key conundrum of two stops vs. three. Those able to stretch out a two-stopper will likely have a big advantage as the pit stop loss time at this track is among the biggest there is - close to 30 seconds - thanks to a lengthy pit lane and lower than usual speed limit. That's before even adding in the probability of safety cars and difficulties in overtaking mentioned. We have also seen here in 2011 and 2012 Paul di Resta get strong finishes - and look well on the way to one last year before a late off - via unusual strategies, and it'll be interesting to see if anyone (perhaps another Force India?) is able to do the same this time. There is a new matter to contend with in fuel also. The anticipated Sunday economy runs for this year with the strict 100kg limit haven't really manifested but it is in this race that the gas available get its fullest workout. Fuel consumption is about as high as it gets at this race, thanks to the all-action track with plenty of braking and accelerating combined with the lengthy duration (safety cars will help though). The lack of long straights makes fuel saving via lift and coast more difficult too. This should help the Merc cars, with that power unit considered to be the most efficient this season. For Williams it has been especially so, though the FW36 with its relative lack of downforce may struggle somewhat on the low grip track. When it comes to downforce though we can usually look to the Red Bull, and indeed that team has reportedly been looking at this weekend as one in which it can get close to the Mercs, particularly if the silver cars falter. Perhaps it'll be close even if they don't. Daniel Ricciardo we know about, but Sebastian Vettel has won here three times as mentioned and has usually looked solid as a rock around this track, so it may be a good place for what by now seems a long overdue bounce back. And there is another matter of the very new variety. That for whatever reason various radio messages, as well as pit board communications, that are to do with aiding driving, have been clamped down on. There has been rather fevered speculation as to the effect it will have, the drivers that may win and lose, those that may be stranded on the grid and the like. Sadly though the most likely manifesttaion is at least a race or two of bickering and recrimination as what is allowed and what is not is wrestled with. And it wouldn't at all surprise me if the effect on the competitive order is negligible. Whatever is the case though, make sure you're plugged in this weekend for F1's very own light fantastic.